Fractional horsepower motor- A fractional horsepower motor (FHP Motor) is an electric motor with a rated output power of 360 Watts or less. There is no defined minimum output, however, it is generally accepted that a motor with a frame size of less than 104 mm square can be referred to as a FHP Motor or Micro-motor. The term 'fractional' indicates that the motor often has a power rating smaller than half horsepower. Uses of FHP Motor: Use of Fractional Motors in the machines where low power and low torque requirements. Earlier peoples are using the high power rating motors for even small amount of torque needed but now Revolution Technology make FHP Motors and FHP Geared Motors are available in the market as we are the leading manufacturers of Fractional HP Motors and FHP Geared Motors. Applications of FHP Motors / FHP Geared Motors: Water treatment plants, Special Purpose Machines, Food machines, Conveyors, Printing machines, etc. FHP Motors are Capacitor-start Capacitor-run, squirrel cage single phase and three phase motors. The RPM available are 1440 / 2880 / 960 and with gearbox RPM can be very low. Depending upon requirement for the connection, motors have Lead wires or terminal box. 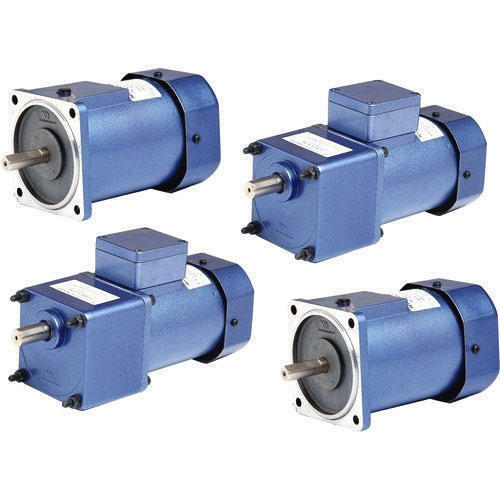 Suitable for continuous operation these motor rotate in clockwise or anti clockwise direction. 25 Watt, 40 Watt, 60 Watt, 90 Watt, 180 Watt, 200 Watt & 360 Watt. Fractional horsepower motor- A fractional horsepower motor (FHP Motor) is an electric motor with a rated output power of 25 Watts Fractional Motors (FHP Motors), 40 Watts Fractional Motors (FHP Motors), 60 Watts Fractional Motors (FHP Motors), 90 Watts Fractional Motors (FHP Motors), 180 Watts Fractional Motors (FHP Motors), 200 Watts Fractional Motors (FHP Motors), 360 Watts Fractional Motors (FHP Motors). There is no defined minimum output, however, it is generally accepted that a motor with a frame size of less than 104 mm square can be referred to as a FHP Motor or Micro-motor. The term 'fractional' indicates that the motor often has a power rating smaller than half horsepower. Uses of FHP Motor: Use of Fractional Motors in the machines where low power and low torque requirements. Earlier peoples are using the high power rating motors for even small amount of torque needed but now Revolution Technology make FHP Motors and FHP Geared Motors are available in the market as we are the leading manufacturers of Fractional HP Motors and FHP Geared Motors. Applications of FHP Motors / FHP Geared Motors: Water treatment plants, Special Purpose Machines, Food machines, Conveyors, Printing machines, etc.We are Leading supplier of Geared Motor. Fractional horsepower motor- A fractional horsepower motor (FHP Motor) is an electric motor with a rated output power of 360 Watts or less. There is no defined minimum output, however, it is generally accepted that a motor with a frame size of less than 104 mm square can be referred to as a FHP Motor or Micro-motor. The term 'fractional' indicates that the motor often has a power rating smaller than half horsepower. Uses of FHP Motor: Use of Fractional Motors in the machines where low power and low torque requirements. Earlier peoples are using the high power rating motors for even small amount of torque needed but now Revolution Technology make FHP Motors and FHP Geared Motors are available in the market as we are the leading manufacturers of Fractional HP Motors and FHP Geared Motors. Applications of FHP Motors / FHP Geared Motors: Water treatment plants, Special Purpose Machines, Food machines, Conveyors, Printing machines, etc. 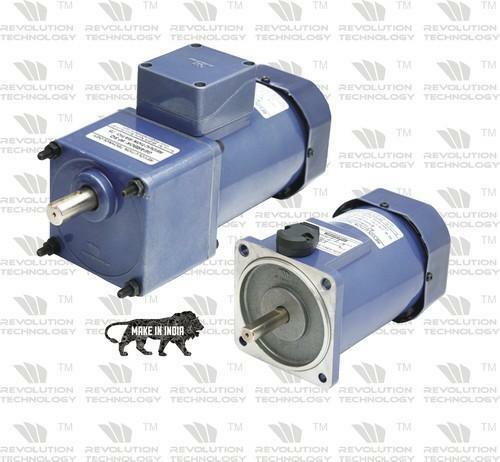 Revolution Technology, Pune is leading manufacturers of Fractional Motors , Gearboxes and Geared Motors also. 25 Watt Fractional Geared Motors, 40 Watt Fractional Geared Motors, 60 Watt Fractional Geared Motors, 90 Watt Fractional Geared Motors, 180 Watt Fractional Geared Motors, 200 Watt Fractional Geared Motors, 360 Watt Fractional Geared Motors. 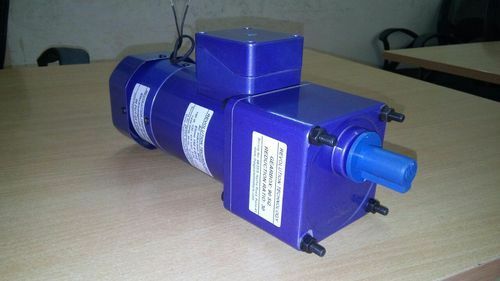 Fractional horsepower motor- A fractional horsepower motor (FHP Motor) is an electric motor with a rated output power of 25 Watts Fractional Motors, 40 Watts Fractional Motors, 60 Watts Fractional Motors, 90 Watts Fractional Motors, 180 Watts Fractional Motors, 200 Watts Fractional Motors, 360 Watts Fractional Motors. There is no defined minimum output, however, it is generally accepted that a motor with a frame size of less than 104 mm square can be referred to as a Fractional Motors (FHP Motor) or Micro-motor. The term 'fractional' indicates that the motor often has a power rating smaller than half horsepower. Uses of FHP Motor: Use of Fractional Motors in the machines where low power and low torque requirements. Earlier peoples are using the high power rating motors for even small amount of torque needed but now Revolution Technology make FHP Motors and FHP Geared Motors are available in the market as we are the leading manufacturers of Fractional HP Motors and FHP Geared Motors. Applications of FHP Motors / FHP Geared Motors: Water treatment plants, Special Purpose Machines, Food machines, Conveyors, Printing machines, etc. Terminal box or open lead wires for connections. 25 Watts Fractional Motors, 40 Watts Fractional Motors, 60 Watts Fractional Motors, 90 Watts Fractional Motors, 180 Watts Fractional Motors, 200 Watts Fractional Motors & 360 Watts Fractional Motors. We are supplying these Fractional Motors to all major part of india like Pune, Mumbai, Delhi, Faridabad, Gaziabad, Ahmedabad, Rajkot, Ambala, Chandigarh, Chennai, Bangalore etc. 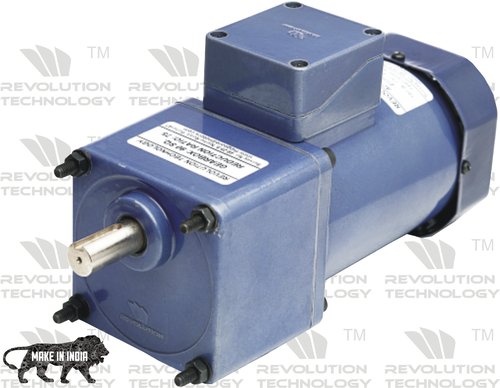 Revolution Technology is leading manufacturers of FHP Motor 360 Watt / Three Phase. Motors are aluminum die-casted and CNC Machined. The Range Includes 25 Watt, 40 Watt, 60 Watt, 90 Watt, 180 Watt and 360 Watt. The Supply Voltages: 230 VAC-Single Phase, 230 VAC-Three Phase, and 415 VAC-Three Phase. Output Speeds: 960 RPM, 1440 RPM, and 2880 RPM. 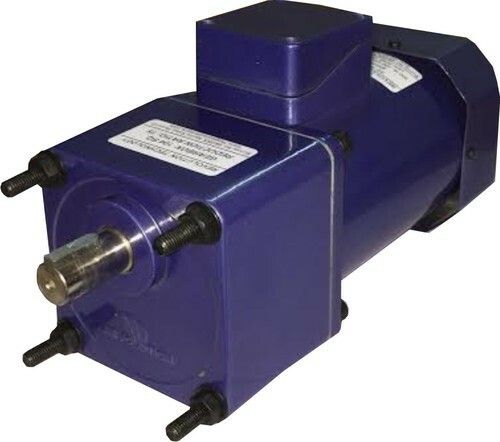 0.25 HP and 0.5 HP Fractional Geared Motors: We specialize in offering the superior quality of custom built 180 Watt ( 0.25 HP) & 200 Watt (0.25 HP) & 360 Watt 0.5 HP) FHP Geared Motors. These are manufactured in such a way that these have stirrer duty and come with contra gears. Precision engineered these are known for robust performance at all conditions. These also come with multi output and are very durable. 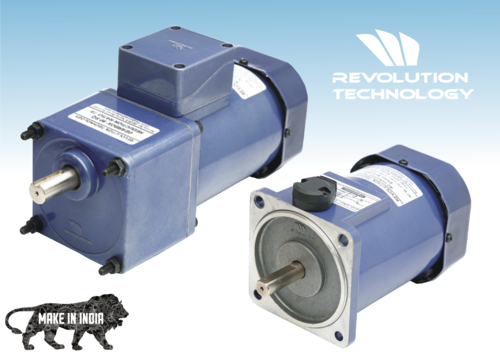 Revolution Technology, Pune are the leding manufacturers of the 0.25 HP Geared Motors and 0.5 HP Geared Motors for the Industrial automation applications.Our range of manufacturing are as follows. 25 Watt Geared Motor, 40 Watt Geared Motor, 60 Watt Geared Motor, 90 Watt Geared Motor,180 Watt Geared Motor, 200 Watt Geared Motor, 360 Watt Geared Motor. We commenced our business operation from many years by offering our clients a premium quality array of FHP Motor 40 Watt. FHP Motor means the Fractional Horse Power Motors. 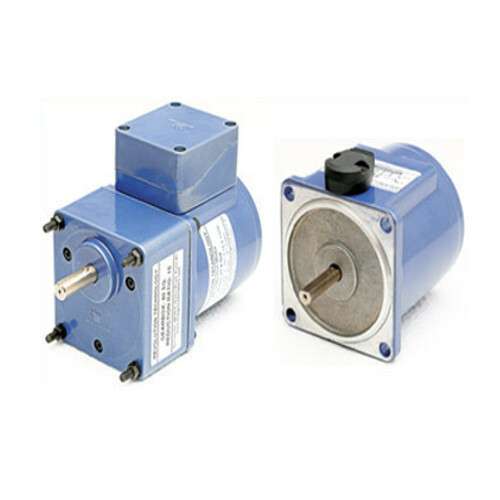 We had developed a series of FHP Motors. FHP Motor is designed and fabricated by our experts using quality certified materials as per the rules laid down by regulatory bodies. FHP Motors are very efficent, FHP Motors are useful to transmit a small torque very nicely. FHP Motor saves the excess use of power. FHP Motors can be used with or without gearbox. We are engaged in manufacturing and offering FHP Motor to our clients. A range of AC Induction Motor, Reversible Motor, E.M. Brake Motor, PMDC Motors with Compatible gearboxes. FHP Motors, AC Induction Motors, Geared Motors. 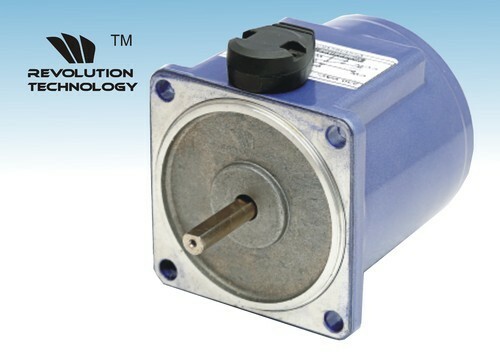 Revolution Technology is leading manufacturers of FHP Motors 180 Watt / Three Phase AC FHP Motors. FHP Motors means Fractional horsepower motor- A fractional horsepower motor (FHP Motor) is an electric motor with a rated output power of 360 Watts or less. There is no defined minimum output, however, it is generally accepted that a motor with a frame size of less than 104 mm square can be referred to as a FHP Motor or Micro-motor. The term 'fractional' indicates that the motor often has a power rating smaller than half horsepower. Uses of FHP Motor: Use of Fractional Motors in the machines where low power and low torque requirements. Earlier peoples are using the high power rating motors for even small amount of torque needed but now Revolution Technology make FHP Motors and FHP Geared Motors are available in the market as we are the leading manufacturers of Fractional HP Motors and FHP Geared Motors. Applications of FHP Motors / FHP Geared Motors: Water treatment plants, Special Purpose Machines, Food machines, Conveyors, Printing machines, etc. 25 Watt FHP Motors, 40 Watt FHP Motors, 60 Watt FHP Motors, 90 Watt FHP Motors, 180 Watt FHP Motors, 200 Watt FHP Motors, 360 Watt FHP Motors. 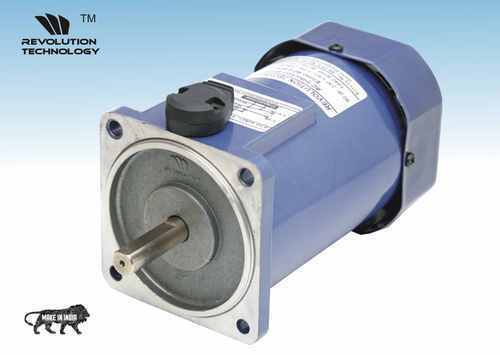 FHP Motor is an electric motorwith a rated output power of 360 Watts or less than 360 Watt. There is no defined minimum output, however, it is generally accepted that a motor with a frame size of less than 104 mm square can be called as FHP Motors.Fractional HP motors are nothing but the FHP Motors meaning fractional horse power motors. Our sourdough professionals and decades of field experience have allowed us in offering an exclusive range of FHP Motor 60 Watt. FHP Motor is is generally used where you need small amount of torque in an automation process. Or it can be used in a fractional power consumption for a rotary machines. 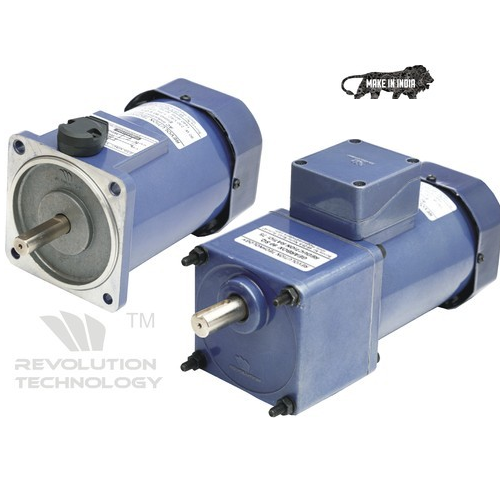 Fractional HP Motors can be used by attaching the gearbox and you will get very low speed. Mostely FHP Motor's use with Gearbox for further low speed. FHP Motors can be used in somany applications like refrigeration plants, small equipments, water treatment plants, food machines etc. Now a days Fractional Horse Power Motors has its own importance so world wide industrial peoples specially needs the FHP Motor and FHP Geared Motors because it has low power consumption. FHP Motor is an electric motor with a rated output power of 360 Watts or less than 360 Watt. There is no defined minimum output, however, it is generally accepted that a motor with a frame size of less than 104 mm square can be called as FHP Motors.Fractional HP motors are nothing but the FHP Motors meaning fractional horse power motors. FHP Motor is is generally used where you need small amount of torque in an automation process. Or it can be used in a fractional power consumpation for a rotary machines. 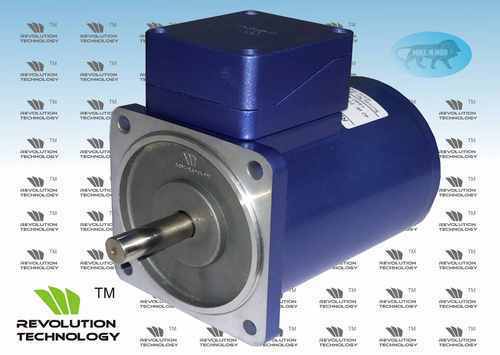 Fractional HP Motors can be used by attaching the gearbox and you will get very low speed. We are leading supplier of Fractinal HP motor. We obligated to meet the quality standards as per the industry norms.Fractional horsepower motor- A fractional horsepower motor (FHP Motor) is an electric motor with a rated output power of 360 Watts or less. There is no defined minimum output, however, it is generally accepted that a motor with a frame size of less than 104 mm square can be referred to as a FHP Motor or Micro-motor. The term 'fractional' indicates that the motor often has a power rating smaller than half horsepower. Uses of FHP Motor: Use of Fractional Motors in the machines where low power and low torque requirements. Earlier peoples are using the high power rating motors for even small amount of torque needed but now Revolution Technology make FHP Motors and FHP Geared Motors are available in the market as we are the leading manufacturers of Fractional HP Motors and FHP Geared Motors. Applications of FHP Motors / FHP Geared Motors: Water treatment plants, Special Purpose Machines, Food machines, Conveyors, Printing machines, etc. Since the commencement of our company, we have developed as the leading manufacturer, exporter, wholesaler, retailer and supplier of FHP Motor 25 Watt. A fractional horsepower motor (FHP Motor) is an electric motor with a rated output power of 90 Watts or less. There is no defined minimum output, however, it is generally accepted that a motor with a frame size of less than 90 mm square can be referred to as a FHP Motor or Micro-motor. The term 'fractional' indicates that the motor often has a power rating smaller than half horsepower. Uses of FHP Motor: Use of Fractional Motors in the machines where low power and low torque requirements. Earlier peoples are using the high power rating motors for even small amount of torque needed but now Revolution Technology make FHP Motors and FHP Geared Motors are available in the market as we are the leading manufacturers of Fractional HP Motors and FHP Geared Motors. Applications of FHP Motors / FHP Geared Motors: Water treatment plants, Special Purpose Machines, Food machines, Conveyors, Printing machines, etc.Our company is the major manufacturer, exporter, wholesaler, retailer and supplier of FHP Motor 90 Watt. We are Leading Supplier of 180 Watt E.M Brake Geared Motor.